The Supreme Court has rightly taken the state governments to task for their failure to prevent bandhs and maintain law and order. The BJP-sponsored Bharat bandh on Thursday on the Amarnath land row in Jammu claimed five lives, injured many people and disrupted train and bus services. Earlier, there was widespread violence in Jammu and Kashmir on the same issue for several days against Governor S.K. Sinha’s getting the land transferred. FACT can be stranger than fiction. And TV reality can be more distressing, at times horrifying, than reality. Take the case of 16-year-old Shinjini Sengupta who ran into serious medical complications after taking part in a reality show. The public rebukes she got from one of the judges in the show was so humiliating for the young girl that she had a paralytic attack and had to be hospitalised. The truth that while democracy entails elections, elections do not necessarily attest to a democratic order is brought home brutally by what President Robert Mugabe is doing in Zimbabwe. The swearing in of Mr Mugabe as President for a sixth term after last week’s run-off — because his opponent Mr Morgan Tsvangirai won the first round of the election but fell short of an absolute majority — after a sham vote was only to be expected. The Punjab government recently asked the Vice-Chancellor of Guru Nanak Dev University, Amritsar, to explain his position before the Home Secretary of the state in respect of a few allegations. This was going beyond the limits of law. The Vice-Chancellor, therefore, refused to present himself before the Home Secretary and that should have been the end of the matter. Over the years spent in public service, I have realised that politicians love attention. And they love their policemen. Surprised? Here is the reason. While ordinary human beings are petrified by the sight of cops, politicians receive salutes from these khaki clad brutes. And when a cop salutes someone, he automatically attains a level of extraordinary importance. The issue of a soldier's right to vote was first taken up in these columns in 1999. It was argued that while Part 111 and various articles therein of the Constitution of India lays down the fundamental rights of a citizen and though certain of these rights are abridged in the case of a soldier, the Constitution did not see any logic in abridging a soldier's right to vote. The United Progressive Alliance government has signed its death warrant.” These were the sharp words used as a reaction to the UPA government’s decision to increase the prices of petrol and diesel to compensate the oil companies that have piled up huge losses due to the sudden spurt in the international crude prices. More than six months after Benazir Bhutto's assassination, the Pakistani authorities' investigation of her killing appears to have ground to a near halt, with the trail growing colder. The elegant and charismatic former prime minister, one of the most popular politicians in Pakistan's history, was murdered Dec. 27 as she left a campaign rally at a park in Rawalpindi, the seat of the Pakistani military. The Supreme Court has rightly taken the state governments to task for their failure to prevent bandhs and maintain law and order. The BJP-sponsored Bharat bandh on Thursday on the Amarnath land row in Jammu claimed five lives, injured many people and disrupted train and bus services. Earlier, there was widespread violence in Jammu and Kashmir on the same issue for several days against Governor S.K. Sinha’s getting the land transferred. Continued blockades on the National Highway 31A by pro- and anti-Gorkhaland protestors have cut off Sikkim with the rest of the country. The Gujjar agitation in Rajasthan continued for several weeks. A Bench headed by Justice Altamas Kabir said: “You (states) all rest and do nothing. Those who are required to act according to the Constitution are party to it. Those who have the muscle power can hold the country to ransom”. It castigated the states and lamented that lakhs suffered during these agitations. Clearly, in a democracy, while one can protest against the policies of the government in a peaceful manner, no one has the right to close shops by force, stop train services, resort to violence and disrupt normal life. In 1997, a full Bench of the Kerala High Court declared bandh as illegal and unconstitutional. The Supreme Court rejected the LDF government’s claim that the high court verdict denied the citizen the right to protest, which was a part of the fundamental rights guaranteed by the Constitution. To evade the judicial verdict, parties like the CPM and the Trinamool Congress called it hartal instead of bandh, but the character of the agitation remained unchanged. Unfortunately, no state government has shown the will to implement the apex court directives on bandhs. Moreover, the Calcutta High Court, the Guwahati High Court, the Bombay High Court and the Orissa High Court have all declared bandhs as illegal. Yet, bandhs continue unabated. In 2004, the Bombay High Court fined the BJP and the Shiv Sena Rs 20 lakh each for declaring a bandh in protest against the Ghatkopar bomb blasts in Mumbai in July 2003. While the state governments should firmly emulate this example, a strong public opinion is necessary to force political parties to shun bandhs. Clearly, the states cannot abdicate their constitutional responsibility of protecting the people’s lives and maintaining normal life. The people also cannot be indifferent to the viles of the politicians who, by encouraging bandhs for narrow petty ends, cause public suffering. The people must protest against the bandhs. FACT can be stranger than fiction. And TV reality can be more distressing, at times horrifying, than reality. Take the case of 16-year-old Shinjini Sengupta who ran into serious medical complications after taking part in a reality show. The public rebukes she got from one of the judges in the show was so humiliating for the young girl that she had a paralytic attack and had to be hospitalised. Everyday, children perform under intense pressure to live out dreams, often not their own but of their parents.Youngsters hurl insults and abuses at others, and face them, all for the perverse pleasure of television viewers. Reality shows feature what are said to be unscripted dramatic or funny situations. They are well-scripted and seldom spontaneous. These shows do have ordinary people as performers, instead of professional actors, picked up through various kinds of questionable selection processes. When adults feature in reality shows, it becomes a voyeuristic spectacle like the Big Brother in which Shilpa Shetty found herself in a controversy that propelled public awareness of the show to stratospheric heights. When children feature in an elimination game or the so-called talent hunt shows, they face the kind of pressures that rob them of their innocence. Sometimes they do cause psychological and even physical damage to the participating children all presented by insensitive TV producers who are always in search of TRP ratings and greed for profits. Pushy parents who try to live their unfulfilled dreams through their children must shoulder a major part of the responsibility for damaging their children’s psyche. They want to enhance their wards’ competitive skills, without preparing them for elimination or failure that an overwhelming number of competitors will have to face — after all there can be only one winner. Union Minister for Women and Child Development Renuka Chowdhury is quite right in blaming the parents and in calling for government checks on such shows. Children deserve better than being paraded on stage, under arc lights and subjected to pressure, ridicule and often public rejection. The TV channels and broadcasters also need to exercise utmost caution when children are involved. The truth that while democracy entails elections, elections do not necessarily attest to a democratic order is brought home brutally by what President Robert Mugabe is doing in Zimbabwe. The swearing in of Mr Mugabe as President for a sixth term after last week’s run-off — because his opponent Mr Morgan Tsvangirai won the first round of the election but fell short of an absolute majority — after a sham vote was only to be expected. With only one candidate in the fray, i.e. Mr Mugabe, there could be only one winner, i.e. Mr Mugabe. Mr Tsvangirai, who rose to challenge Mr Mugabe at the head of the Movement for Democratic Change (MDC), had little choice but to flee the electoral arena in the wake of the violence and terror unleashed against voters. Such was the terror and repression – in which at least 90 were killed and thousands injured – that Mr Tsvangirai asked people to vote for Mr Mugabe if it was required for their survival and safety. Mr Mugabe has ruled Zimbabwe uninterruptedly since it won independence after a protracted liberation struggle some 28 years ago. The man who came to power as a liberation hero and defender of democracy, turned out to be not a even run-of-the-mill dictator but a tyrant who ensured that his countrymen should know of no other leader. If his political record is abominable, his economic leadership has been disastrous; so disastrous that economic analysts differ only on whether inflation is 2 million or 9 million per cent. The unlimited terror of his reign coupled with abject poverty has made may Zimbabweans flee the country. The election results have been almost universally condemned. Some of the tallest African leaders such as Nelson Mandela and Desmond Tutu have spoken of the “tragic failure” of leadership and advocated radical intervention for democratic change. The international community has refused to recognise the election outcome, as have several African states. The sham election is bound to cast a shadow on the African Union summit now under way in Egypt. Mr Mugabe, who has been contemptuous of international opinion, is unlikely to be checked in his dictatorial ways until and unless he is shunned by all of Africa. There is also the dilemma of how to put Mr Mugabe in his place without hurting further a country and people who have been pushed beyond the limits of human endurance. Perhaps, Mr Tsvangirai may have some tentative answers and these are worthy of attention by the world and particularly by other African nations. Everyone who is in the know of things knows who is biting whom and why. It should not be necessary to go into the details except to say that the state government has consciously embarked upon a course of action which is in violation of law. Now that the unavoidable outcome is a matter of the past, everyone knows that nothing more is going to happen, nor indeed can happen. All procedures have been complied with and there is nothing more to do. What is more, nothing is morally or legally wrong anywhere. Why was this done? The answer is simple. We are living in a period when politicians have forgotten that universities must not only perform but must also be enabled to command respect. In this connection. I am reminded of something which happened during the regime of Partap Singh Kairon. Dr A.C. Joshi, who was the Vice-Chancellor of Panjab University during those years, told me this story himself. Whenever there was a problem and the state had to be consulted, he would ask the Chief Minister over the phone for an appointment. Kairon invariably volunteered to pay him a visit at a mutually convenient hour and would have the matter sorted out. Not even on one occasion did Kairon encourage the idea of the Vice-Chancellor visiting the Secretariat. On one occasion, the matter concerned two other ministers also. So, Kairon agreed to a visit by the Vice-Chancellor to the Secretariat at an appointed hour. Indeed, Kairon did more than that. The Vice-Chancellor was received at the entrance by the Chief Secretary and the concerned ministers were present in the room when Dr A.C. Joshi arrived. The whole thing was sorted out in 10 minutes and that was the only time that he visited the Secretariat on official business. The occasion for this conversation arose when in some other connection I mentioned to Dr Joshi that soon after Kairon’s death I had met an old teacher of his at the University of Michigan. Kairon had gone there for his master’s degree. After a preliminary conversation, Kairon’s teacher asked me about his old student who, he had heard, had been shot down a short while ago. He had some idea of what had happened but he wanted to know more details. I cannot say that he told me anything new except that Kairon used to visit his teacher frequently at home and talked with deep concern about the British hold of India and how to get rid of it. It was a very lively conversation. I learnt about Kairon’s views as a student and this gentleman’s perception of him. His wife also remembered Kairon vividly. Why did Kairon deal with Dr A.C. Joshi the way he did? The answer is obvious. Having seen the American system at work from close quarters, he tried to do something of the same kind in India in his own way. That he failed to establish what he wanted is obvious. Nor is it suggested that the state of Punjab is worse than other states. Almost each state in India has sooner or later gone political. The intention is not to condemn the state of Punjab in particular but to make the point that if India is to grow as a democratic and progressive country, some of the conventions about university autonomy that have grown up in the other countries would have to be cultivated here. If somebody blames the vice-chancellors also for being political in response, it should not be forgotten that it all begins with the state. What the vice-chancellors do is to some extent an imitation of what is done to them. Once the state decides to act non-politically, the vice-chancellors would have no choice except to follow that model and act accordingly. Without going into further details, let it be said that if the state of Punjab wishes to be non-political in its dealings with the Vice- Chancellor at Amritsar, it would be difficult to locate a more suitable person for the purpose. He cannot act politically even if he wishes to. Those who know him would vouch for this statement. This is not the direction in which the state of Punjab should move. The issue, however, is not personal. The issue is: can the state act non-politically if it wishes to? Here a clear line of distinction needs to be drawn. As a matter of fact, it has already been drawn up. According to the University Act, the Vice-Chancellor’s appointment is made by the Chancellor. If the Vice-Chancellor does not act correctly, there are two ways open to the state. Whether the matter is handled orally or in writing, it will all depend upon the seriousness of the issue. The Chancellor can talk to the Vice-Chancellor and ask him to do something or do it differently and so on. In this particular case, these provisions of the Act were not adhered to. Instead, orders were issued whereby the Vice-Chancellor was required to explain a particular situation to the Home Secretary. This was adding insult to injury. At this stage one can go beyond the details of the case. The state has to make up its mind on how to deal with a Vice- Chancellor. The convention sought to be developed by Kairon has failed to develop. Over the decades, things have changed and Punjab is no exception to what has been happening in the country. But should the state of Punjab now wish to establish a new convention, there is nothing to stop it from doing so. It is not necessary to develop this point further. What needs to be underlined is that a university is different from activities like transport, irrigation or home affairs. All such activities fall directly under the control of the state administration. In a sense, so does the university. But experience in various democratic countries has shown that universities should be treated differently. It is not difficult to do so except that an appropriate convention will have to be established. In response to it, the vice-chancellors, too, will begin to act differently. And that is precisely what is wanted. To repeat, the initiative has to come from the state. More than anything else, politicians of stature look forward to a guard of honour — a posse of policemen clad in ceremonial dress, who swing their rifles in unison to offer a special kind of salute to VIPs. I am sure you have seen some on the TV. There is a tradition in North Indian states. Every minister, after taking the oath, rushes to his constituency. He is received by the District Magistrate and the Superintendent of Police at the Circuit House. Later he proceeds for the guard of honour. Now a guard like that is usually commanded by a sub-inspector, who stands ahead of 11 policemen wearing ceremonials, carrying rifles and a bugle which is blown when the guard commander salutes. The drill is truly impressive. There was a minister who had an “illustrious” criminal record and had been to jail several times before contesting elections and making it to the Legislative Assembly. Naturally, he had seen a lot of cops, especially at the Daroga level, from very close quarters, literally. After taking the oath he rushed to his constituency and, as per tradition, was received by the DM and the SP. Then he proceeded to be received by the guard of honour. An exceptionally tall, tough-looking sub-inspector, who roared like a lion and excelled in drill, had been handpicked to be the guard commander. After all, it was the first visit of the honorable Mantriji to the district. Nothing could be left to chance. Mantriji returned the salute and permitted dispersal. “Santri khadaa rahe, baaki visarjan”! (Sentry stand-by, others to disperse). The guard dispersed. The guard commander saluted, the VIP responded, but then he was surprised to see the honorable minister still rooted to the spot. The DM and the SP were clueless. But if the VIP preferred not to move, how could they? The guard commander froze in attention, suspecting a faux pas committed during the drill that had been noticed by the VIP. He expected admonishment. After all, adult franchise is the very bedrock on which a democratic structure has to rest its foundation. Of all the citizens, it is the soldier who puts his life on the line to defend our democratic system and finally the Constitution. While the framers of the Constitution of India gave this right to the soldier, they could not visualise the ingenuity and capacity for mischief of the bureaucracy to subvert so fundamental a right of the soldier. It introduced the "postal ballot system," a system which ensured that a vote may be cast but would not get counted. The time between the announcement of elections and the date the votes are to be cast being short, postal ballot would not complete the journey from the Electoral Registration Officer (ERO) to the soldier's Record Office, then to his unit, and finally back to the ERO. This is so because the greater part of the army is deployed in remote areas with indifferent postal services; even military postal service channels could not shorten the travel period of the postal ballot. The Representation of the People Acts, 1950 and 1951, have the provisions for making rules enabling certain category of persons to vote by postal ballot. Interestingly, this provision was made essentially for persons subjected to preventive detention under the law! Applying the same provision to a soldier is somewhat degrading. What added to this problem was the fact that there is nothing in the Representation of People Acts 1950 and 1951, which enjoins on the polling staff for timely and accurate completion and prompt dispatch of postal ballot papers. Since there is no accountability built into the Act for the polling staff, it's approach to timely dispatch of postal ballot papers is lackadaisical, to say the least and a dereliction of duty in more specific terms. When these drawbacks were pointed out to the Election Commission and the political class, the idea of proxy voting was thrown up without realising the oddity of reducing adult franchise to a voting system of a limited company. Even so there was no consensus between the political parties and the issue dragged on endlessly. A committee of secretaries was asked to resolve the issue, which killed it by merely sitting on it. Moreover, proxy voting had some other complications such as authentication of proxy by a magistrate or an oath commissioner and practical difficulties in such a process for every assembly and general election. It was necessary to take up this cause because the fundamental right of soldiers, as citizens of the Republic of India, to exercise their vote was being denied to them through a mischievous bureaucratic fiat and political dithering, disinterest and indecisiveness. The inbuilt drawback of postal ballot lay in another area as well. While a soldier was given the option to exercise his vote through postal ballot, the sequence and procedure ensured that only a very small percentage of votes arrived in time for the same to be valid. It was pointed out that in the assembly elections of 1996 only 2.7 lakh ballot papers were received by the record offices at various regimental centres and this figure dropped to 2.6 in the case of the 1998 assembly elections, against 7.4 lakh registered service voters. Besides, there have been innumerable deficiencies and inaccuracies in these ballot papers such as wrong names, papers of Air Force personnel sent to the Army etc. Consequently, the majority of these postal ballots were rendered invalid. Our hunch was that only a miniscule of the over 2.6 lakh votes cast by armed forces personnel through the postal ballot arrangement, actually came to be counted due to the inherent flaws in the system. The Election Commission could not furnish information on the actual votes cast through postal ballot that came to be counted, or were valid. We argued that as per the Constitution, a person whose name appears in the electoral rolls cannot be prevented or denied the opportunity from casting his vote at the designated polling booth. When the proposal to allow soldiers to vote at the place of their posting was first mooted, the Election Commission came up with the argument that the Army is deployed in large numbers in J and K and the NE and, as such, could influence the formation of a government there and be given this right only when its number is substantially reduced in these areas. We pointed out that such an argument had no validity, giving the example of our PM, who represents Assam! Finally and happily, the Election Commission saw the logic in the argument and the disservice it was doing to the democratic cause by denying voting rights to such a large number of soldiers. Consequently, the Election Commission vide its letter dated October 9, 2001, pointed out that armed forces personnel have the option of getting themselves registered on the electoral rolls at the place of their posting and thereby can exercise their franchise at that place. Therefore, to give a soldier his fundamental right to vote, it is the bounden duty of the unit, station, sub area, area commanders, air force and naval stations commanders, to ensure that troops are enrolled as voters at the place of their posting, with the ERO by submitting Form-6, appended to the Registration of Electors Rules 1960. Else through liaison with the local ERO, house-to-house enumeration should be organised. This procedure can be easily adopted even where troops are deployed in remote areas. Families of soldiers too should be enrolled on the electoral roles. The one-liner reaction came from Lal Krishna Advani, who was named six months ago as the BJP candidate for the post of Prime Minister. Since then he has been behaving as if the only next Lok Sabha elections were between him and the post. The man, who has already put his one foot in the coveted office, was expected to display his long-term vision in stead of indulging in politics of one-upmanship. He is expected to understand changing global trends as the Prime Minister of the country is expected to. He will have to, after he occupies the office, govern the country. Hence he is expected to display an understanding of long-term politics instead squeezing political mileage for tomorrow only. 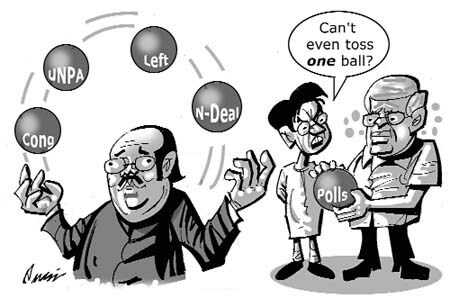 Advani will also have to face the issue of spurt in crude prices if he manages to occupy the high office. But he has not shown any brilliant idea that would allow the government in charge to continue without imposing the additional burden on the masses that were already reeling under the impact of galloping inflation. Even the Manmohan Singh government knew that it was a decision that could spell disaster for electoral politics. Yet it could not escape after weeks of dithering over the issue of compensating the oil companies that were on the verge of collapse due to the mounting losses. Even slashing the customs and excise duties was not enough to meet the loss. States were reluctant to bring down their taxes as petrol and diesel were the main revenue source for them. Hence the new government may also have to go in for another sharp increase in the prices of petroleum products unless it prefers to behave in an irresponsible manner and allow the whole economy to collapse at the altar of populist politics. There are no known methods by which the cost of production can be brought down if raw materials get costlier. Advani should have showed his brilliant vision and suggested the way in which the government could compensate oil companies without resorting to increase in the issue prices. The Advani supporters would certainly be ready with the argument that Advani was not bound to bail out of the incumbent government by showing the way through his vision. Obviously, to score a brownie point they would overlook that Advani could have established the fact that he was better equipped with a long-term vision and had effective solutions that would not burden the masses with unnecessary loads of taxes and consumption costs. More than six months after Benazir Bhutto's assassination, the Pakistani authorities' investigation of her killing appears to have ground to a near halt, with the trail growing colder. The elegant and charismatic former prime minister, one of the most popular politicians in Pakistan's history, was murdered Dec. 27 as she left a campaign rally at a park in Rawalpindi, the seat of the Pakistani military. Yet while her death at 54 stunned Pakistan and the world, no independent Pakistani commission has been appointed to investigate the assassination, and police activity is barely sputtering along, according to several people familiar with the case. The lack of progress comes despite the fact that her Pakistan People's Party is now the senior partner in the country's governing coalition, and her widowed husband, Asif Ali Zardari, wields enormous influence as the party's leader. "It looks as if it's a forgotten chapter," said Talat Massood, a retired general who is now a political analyst. "The internal agencies are not very active and focused on it"
Baitullah Mehsud, the Taliban commander swiftly blamed by the Pakistani government for masterminding the assassination, remains free in Pakistan's tribal areas. Military officials say there has been no attempt to capture him. Beyond accusing Mehsud, the government has made little visible headway. The cases of five people arrested in the weeks following Bhutto's death are being heard before a special anti-terrorism court in Rawalpindi. But even the prosecution describes the accused as relatively low-level figures in the plot. Naseer Ahmed Tanoli, the lawyer for three of the five accused, says his clients have been subjected to torture and prevented from seeing family members or legal counsel. The court proceedings are secret, but another session is scheduled for mid-July, lawyers said. The key players in Bhutto's killing -- those who financed the operation and recruited the assailants -- remain at large, said a senior police official, speaking on condition of anonymity. Police have been ordered not to speak publicly about the case. Two senior officers reneged on an agreement to be interviewed about the status of the investigation , saying they could not discuss it without the authorization of Rehman Malik, the top official in the Interior Ministry, Pakistan's top civilian law-enforcement agency. Malik did not respond to requests for an interview or for permission to talk to investigators. A People's Party loyalist, Malik was Bhutto's senior security adviser at the time of the assassination, and his own decision-making about her security arrangements has been sharply criticized. The possibility of involvement by former or current figures in the government or security agencies has never gotten a full airing, analysts say. "There are two ways to kill a person: one is to attack them, and the other is to make sure security is so lax, you know that one of a number of people coming at them will succeed," said Ikram Sehgal, a former senior military official who is now a journalist and analyst. Doctors who attended to Bhutto on the night of her killing have also been ordered to remain silent – restrictions initially put in place by the previous government led by President Pervez Musharraf. Asked whether the transfer of political power to Bhutto's party meant he could now speak freely about the case, a doctor from Rawalpindi General Hospital replied: "No way, no way." The doctor, who was present as a team of physicians fought to save the former prime minister's life, demanded anonymity fearing reprisal from Pakistan's security services. Before taking power in elections held six weeks after the assassination, Bhutto's party expressed deep skepticism about the government's version of events surrounding the killing, including the conclusion that she was killed by the suicide bomb that hit her vehicle rather than by gunshots. At the time, her party's officials were also demanding an investigation of several former and current government officials whom Bhutto had named as a threat to her security. She cited the names in a letter to Musharraf, written after she escaped uninjured from a massive suicide bombing that killed more than 150 people in the port city of Karachi during her homecoming convoy last October. None of those mentioned have been formally called for questioning. And one, former Intelligence Bureau chief Ejaz Shah, was allowed to leave Pakistan in March, according to officials and Pakistani news reports. Bhutto's party now says it has no plans to appoint an independent Pakistani commission, saying that only the United Nations can carry out a credible investigation.U.N. Secretary-General Ban Ki-moon said in late June that the request was under review, but many analysts believe the world body is unlikely to undertake such a mission.